Headteacher Andrew Clay explains the evaluation and planning model he uses at Coundon Court School to help middle leaders develop their critical thinking and evaluation skills, and produce effective departmental improvement plans. Developing the leadership and critical thinking skills of middle leaders is a priority for many schools, I suspect. At Coundon Court, it was a challenge we faced during our journey from ‘requires improvement’ to ‘good’ in 2016, as we moved away from directive and centralised leadership to a more dispersed model. How well are we performing now? What evidence justifies this judgement? What is helping and hindering our success? What are we planning to do next? The process begins with the individual middle leader or team making an initial, intuitive judgement based on a four-point scale, from inadequate to outstanding. While starting with the judgement may be counterintuitive, it is supported by research indicating that self-evaluation is the most effective starting point for learning, especially when followed by feedback based on criteria and evidence (Visible Learning by John Hattie 2009). With that in mind, next we consider the judgement against agreed criteria, which in most cases is the Ofsted criteria. At this stage the individual’s or team’s view is put in a wider context. This not only raises awareness of expectations but also informs, or validates, their professional perspective. Next, we analyse the factors that help and hinder success in that area. We identify people and resources that have aided, or may aid, progress and set these against opposite forces that hinder or may become barriers to improvement. Once we have identified those under the control of the school, team or individual, they can be prioritised and planning can begin. Finally, we move to action planning. This is where we go into detailed questions, such as: What do we need to do? Who does it? What resources are needed? When will it be done by? How it will be measured? The scaffold we use for this process is a software tool called iAbacus, which provides a structure that guides middle leaders through the cycle above. The concept of a traditional abacus is used as a powerful visual stimulus that assists in precision thinking. The simple starting point of sliding a bead along a continuum and then justifying its position instantly creates a thought process. This can be readily shared around a table with the abacus on a screen. What we find useful about this process is that it places ownership and judgement forming within a team. It also promotes a discussion about standards against the Ofsted framework. While many staff are self-aware and able to independently and accurately engage with this, the real value comes from when there is a conflict of opinion within a team or between a subject leader and the senior team. I have used this process as a valuable coaching tool with new middle leaders. For instance, in one case I was meeting a colleague who I felt had an inflated view of their team’s performance. The individual’s initial evaluation put all the beads in the ‘good’ zone. This was in spite of examination data that suggested otherwise and teaching observation data (informal and formal) that triangulated with the exam data. The process allowed for a rigorous dialogue about the initial assumptions and how they required adjustment. It enabled this colleague to see things in a new way and allowed for professional growth in terms of insight, reflection and action planning. In this way it is a very useful leadership development tool, as it depersonalises such conversations and creates a model for analysis and judgement that removes subjectivity. For new and inexperienced staff, it is also a useful scaffold for thinking and planning. What this model gives us is a fluid, dynamic process that allows for ongoing changes to be readily incorporated as context and thinking evolved. Planning is not really a simple annual cycle. This is especially the case in the new, linear examination world. 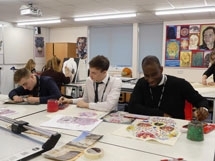 Planning is now much longer term in terms of ensuring real, deep-seated improvement in subject teams’ activity and especially teaching and learning. The model helps to sharpen thinking, and the process lends itself to quick and straightforward moderation of middle-leader understanding. Can a department head or a deputy headteacher sum up neatly where their area is currently and what needs to change? Going through the process helps to get our senior and middle leaders to that point of clear insight. Finally, I would stress the importance of conversation and real collaboration in all of this. Having the iAbacus software to guide evaluation and planning is useful but does not replace the need for dialogue and face to face challenge and support. What it does is to strengthen the focus of face-to-face dialogue and scaffold a way forward. It enables leaders at all levels to frame a conversation that challenges in a rigorous and objective way. This is its real value.